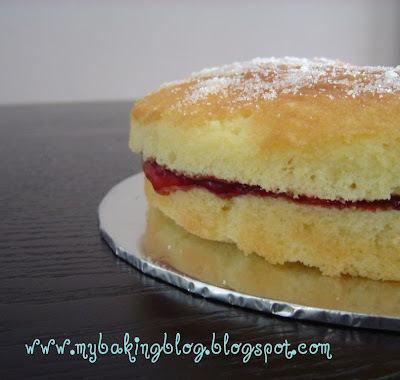 This month's Sweet & Simple Bake is Victoria Sandwich Cake. I baked this last night, and was pleasantly surprised to realise how hassle-free this recipe is. The ingredient list is short, the amount of equipment and utensils used are washup-friendly. More importantly, my mixture did not curdle (like they usually do) when I added the eggs in, as I did exactly as instructed and added the eggs 1tsp at a time. I'm so glad to pick up an important tip. Though my cake did not turn out a nice even brown as the cake in the SSB website, I am pleased with this first attempt. And I only have one 6" tin, I baked the whole thing in one tin instead of 2 tins. Then I sliced it in half and spread the strawberry jam. As soon as the cake was filled with the strawberry jam, I ate a slice, and so did my husband. It was yummy! My cake was a 6" one, with 2 slices gone, it looked like half the cake was gone. This morning, I googled the origins of Victoria Sandwich cake. Sprinkling sugar on top is quite an important part! I did not sprinkle sugar on top last night, as I thought it would be too sweet. After googling, I went to sprinkle sugar on the remaining cake and took some new pictures, haha! I brought 2 slices for my parents to try and they liked it. When I came back just now, there was none left for me. I sure will be making this again! And I will be getting a 8" tin or another 6" tin, so that I can have more cakes! lovely! we enjoyed it too! thanks! I like your cake too! thanks for choosing this recipe, I thoroughly enjoy it. In fact I bought a 8" pan today, just so that I can make a bigger cake soon! like your idea of different jams, I'm sure it tasted fantastic! Your cake looks wonderfully delicious! Thanks for taking part and hope you will join us in our next bake. Hi there, your cake looks beautiful! Lovely picture. 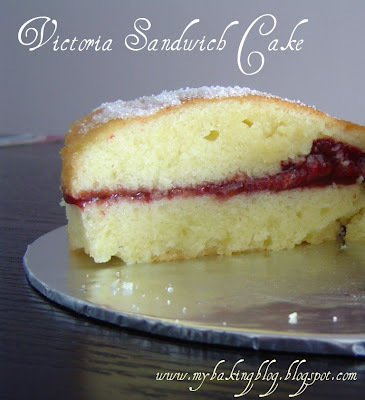 The Victoria sandwich looks really delicious..